« Should We Tap the SPR? Gas prices are high, we’ve all heard, and they’re getting higher. There’s enough blame to go around. For starters, look at the speculators, who determine the price of oil based on a handful of global conditions, including production levels, weather over shipping routes and demand. And then look at volatility in parts of the Middle East, specifically in Iran, Syria and parts of Egypt, where production and oil transport are held hostage by defensive, hawkish regimes. 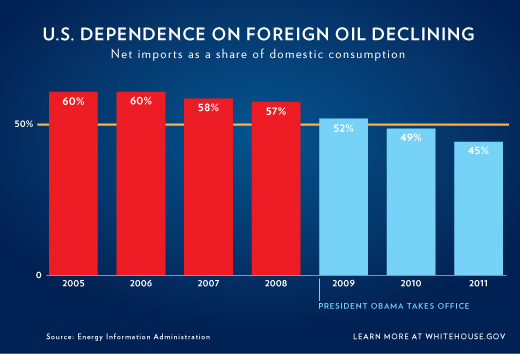 Since Obama took office, foreign oil imports have dropped below 50 percent. It’s a notable trend, and certainly appropriate to give Obama some credit. The reason this decline is possible is because of expanded domestic drilling in the Gulf and permitting for onshore development. Ken Salazar, the secretary of the interior, would tell you it’s a remarkable accomplishment to expand domestic development, despite the worst PR the oil industry could have gotten with the Gulf oil spill in 2010. But it’s also important to put this chart – and this line of White House messaging – in perspective. It is, in all frankness, a gimmick. Foreign oil, with all its evilness, is part of a massive system that delivers crude every day around the world where demand is highest. The notion that we should produce more here to depend less on other countries is patently wrong. The U.S. has not nationalized development, which means that private companies, like BP or Exxon, actually do the dirty work. And there’s nothing that says they HAVE TO sell to U.S. consumers. Usually, they don’t. Oil is a global commodity so they sell to the highest bidder, whether it’s the U.S., China, Russia, or whoever has the cash that day to make it worth their while. There’s a ton of disingenuousness in the political response to high gas prices. Newt Gingrich’s promise to get $2.50 gas is an obvious example. Congressional Republicans tying Obama’s cancelling of the Keystone XL pipeline to the rise in fuel costs is certainly another. Obama’s chart is factually sound, but the idea behind it is not exactly relevant at the moment. Oil imports have gone down and, as a result, we depend less on unfriendly dictators. But that idea has virtually nothing to do with gas prices soon going down. We’re sorry to be the ones to tell you, but they won’t.